Old Trafford side in talks to bring in Bernabeu attacker. Man United have agreed terms ‘in principle’ with Cristiano Ronaldo following talks between the Premier League side and the Real Madrid star’s agent Jorge Mendes. Old Trafford chief executive Ed Woodward has been sanctioned by his side’s board to pursue a deal to re-sign Cristiano Ronaldo and given a blank cheque to make the move a reality. Having sold Ronaldo to Real Madrid in an £80m deal back in the summer of 2009 Man United will offer the Spanish giants £60m for the Portuguese international in a bid that is more likely to be launched next summer than in the January transfer window. Ronaldo will have turned 30 by next summer and an offer of this magnitude for the player may be one that Real Madrid president Florentino Perez accepts, especially if the club’s prized asset makes it clear he wishes to return to his former club. Though Cristiano Ronaldo has been an outstanding success at Real Madrid his side has secured just one La Liga title in his five completed seasons in the Spanish capital and the arrivals of Gareth Bale and James Rodriguez reduce his star power with Perez looking to plan for the long term. Indeed Perez is said to have targeted Chelsea’s Eden Hazard as a potential replacement for Ronaldo. Man United have offered a four year deal worth a stunning £320k a week and it’s a deal that agent Mendes has tacitly agreed with Real Madrid now having to consider the formal offer that the Premier League side will register in due course. Louis van Gaal was handed £150m to invest in new additions this summer and the club’s owners are ready to further back the Dutchman as they seek to put together a squad that can usher in a new era of domestic and continental dominance. Moves to fund such advances are aided by the £750m deal struck with kit suppliers Adidas though van Gaal is ready to offload a number of players he doesn’t deem as part of his plans with the likes of Marouane Fellaini, Ashley Young, Anderson and Rafael linked with moves away from the club along with loaned out pair Javier Hernandez and Tom Cleverley. 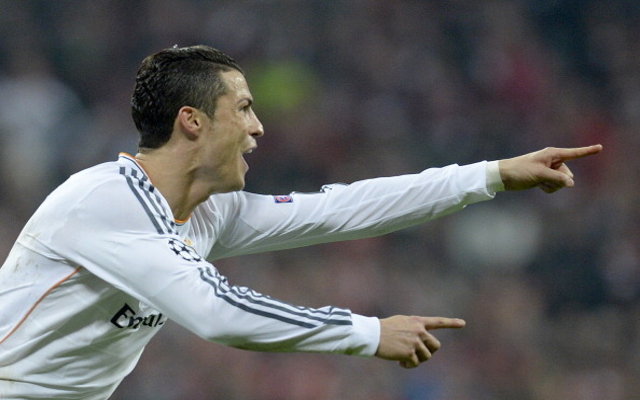 Ronaldo has netted a phenomenal 255 goals in 250 appearances for Real Madrid.